Luigi di Borbone, Principe di Borbone delle Due Sicilie was born on 1 August 1838 at Naples, ItalyG.2 He was the son of Ferdinando II di Borbone, Re delle Due Sicilie and Maria Theresia Isabella Erzherzogin von Österreich.2 He married Mathilde Ludovika Herzogin in Bayern, daughter of Maximilian Joseph Herzog in Bayern and Ludovika Wilhelmine Prinzessin von Bayern, on 5 June 1861.3 He died on 8 June 1886 at age 47 at Paris, FranceG. Margarete Prinzessin von Thurn und Taxis was born on 8 November 1909 at Château de Beloeil, BelgiumG.2 She is the daughter of Alexander Karl Egon Theobald Lamoral Johann Baptist Maria Prinz von Thurn und Taxis and Marie Susanne Marguerite Louise, Prinses de Ligne.2 She married Gaetano Maria Giuseppe di Borbone, Principe di Parma, son of Roberto I di Borbone, Duca di Parma and Maria Antonia Adelaide de Bragança, Infanta de Portugal, on 29 April 1931 at Paris, FranceG.3 She and Gaetano Maria Giuseppe di Borbone, Principe di Parma were divorced on 30 August 1940 at Budapest, HungaryG. She and Gaetano Maria Giuseppe di Borbone, Principe di Parma were divorced on 24 January 1950 at Paris, FranceG. [S45] Marcellus Donald R. von Redlich, Pedigrees of Some of the Emperor Charlemagne's Descendants, volume I (1941; reprint, Baltimore, Maryland, U.S.A.: Genealogical Publishing Company, 2002), page 62. Hereinafter cited as Pedigrees of Emperor Charlemagne, I. [S45] Marcellus Donald R. von Redlich, Pedigrees of Emperor Charlemagne, I, page 61. Auguste Viktoria Prinzessin von Hohenzollern-Sigmaringen was born on 19 August 1890 at Potsdam, Brandenburg, GermanyG.2 She was the daughter of Wilhelm Fürst von Hohenzollern-Sigmaringen and Maria Teresa di Borbone, Principessa delle Due Sicilie.1 She married, firstly, Manoel II de Bragança e Saxe-Coburgo-Gotha, Rei de Portugal, son of Carlos I de Bragança e Saxe-Coburgo-Gotha, Rei de Portugal and Marie Amélie Louise Hélène d'Orléans, Princesse de France, on 4 September 1913 at Schloss Sigmaringen, Sigmaringen, Baden-Württemburg, Germany.2 She married, secondly, Graf Robert Douglas, son of Graf Ludwig Vilhelm Douglas and Gräfin Anna Louise Dorothea Ehrensvärd, on 23 April 1939. She died on 29 August 1966 at age 76. Hans Joachim Oehmichen was born on 4 October 1920 at BarnitzG. He married Diane Marguerite di Borbone, Principessa di Parma, daughter of Gaetano Maria Giuseppe di Borbone, Principe di Parma and Margarete Prinzessin von Thurn und Taxis, on 21 March 1961 at Stuttgart, Baden-Württemburg, Germany. He died on 11 July 1995 at age 74 at Bad Krozingen, GermanyG. Note that he was fathered by Hans Ochmichen even though his mother, Diane, wasr still married to Franz Joseph. 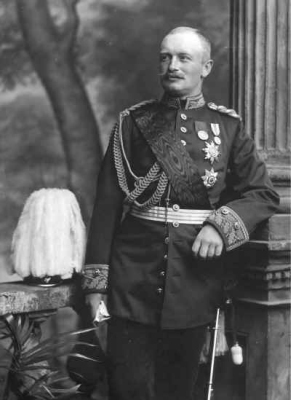 Friedrich August III König von Sachsen was born on 25 May 1865. He was the son of Georg I Friedrich August Georg König von Sachsen and Maria Ana de Bragança e Saxe-Coburgo-Gotha, Infanta de Portugal.3 He married Luise Antoinette Maria Erzherzogin von Österreich, daughter of Ferdinand IV von Österreich, Granduca di Toscana and Alix di Borbone, Principessa di Parma, on 21 November 1891 at Vienna, AustriaG. He and Luise Antoinette Maria Erzherzogin von Österreich were divorced on 11 February 1903.4 He died on 18 February 1932 at age 66 at SibyllenortG.